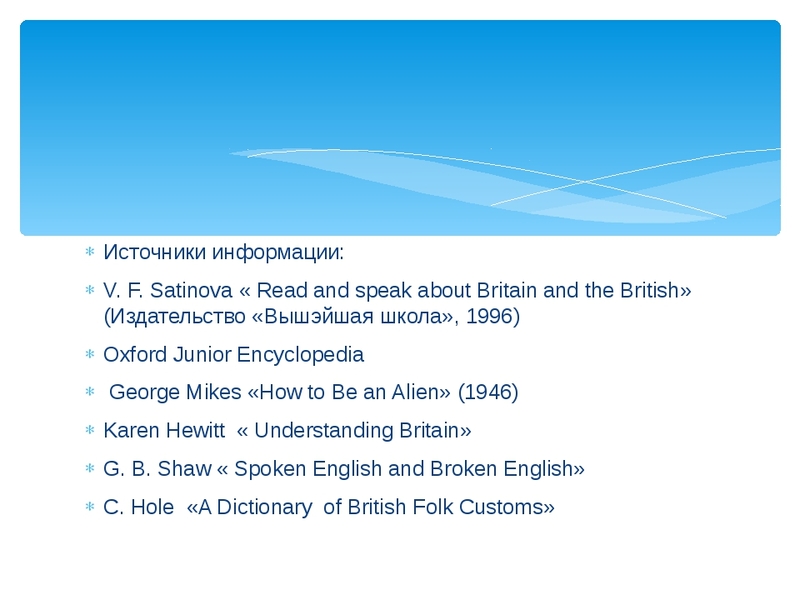 Презентация по английскому языку на тему"Британцы- какие они есть?". Главная / Иностранные языки / Презентация по английскому языку на тему"Британцы- какие они есть?". 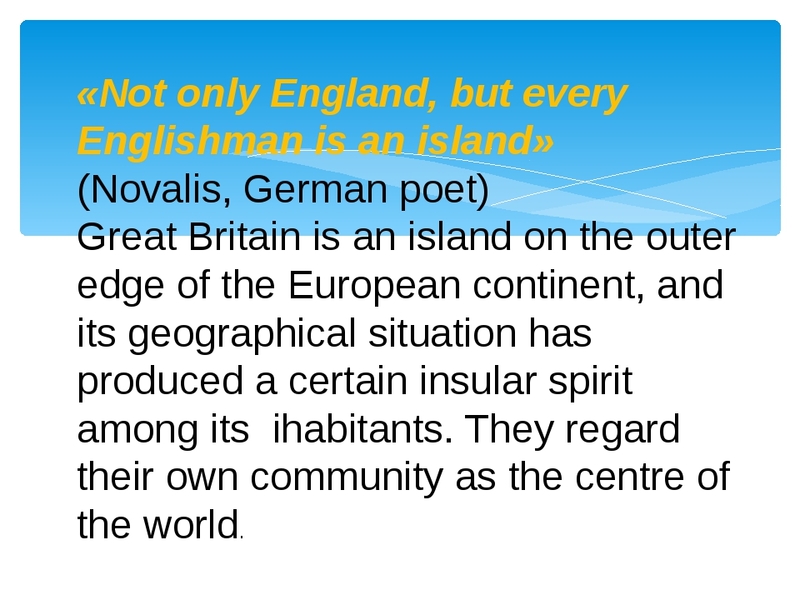 «Not only England, but every Englishman is an island» (Novalis, German poet) Great Britain is an island on the outer edge of the European continent, and its geographical situation has produced a certain insular spirit among its ihabitants. 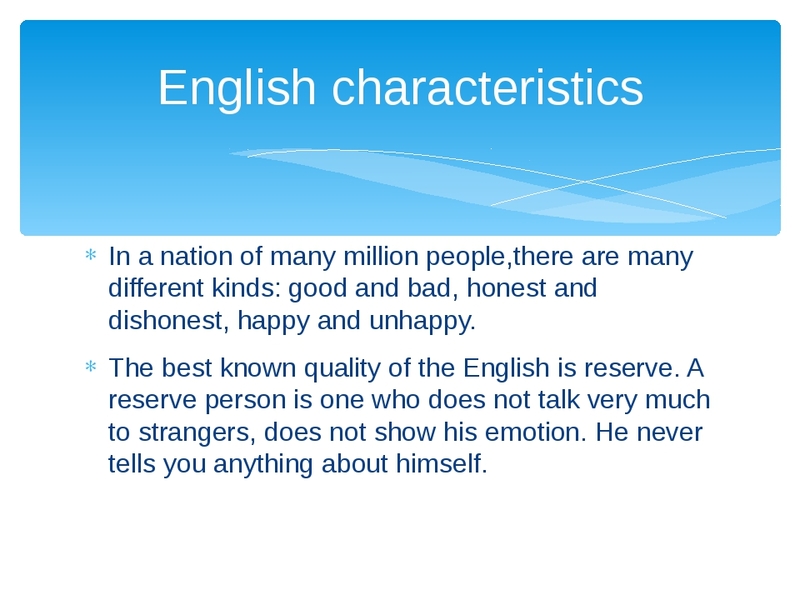 They regard their own community as the centre of the world. 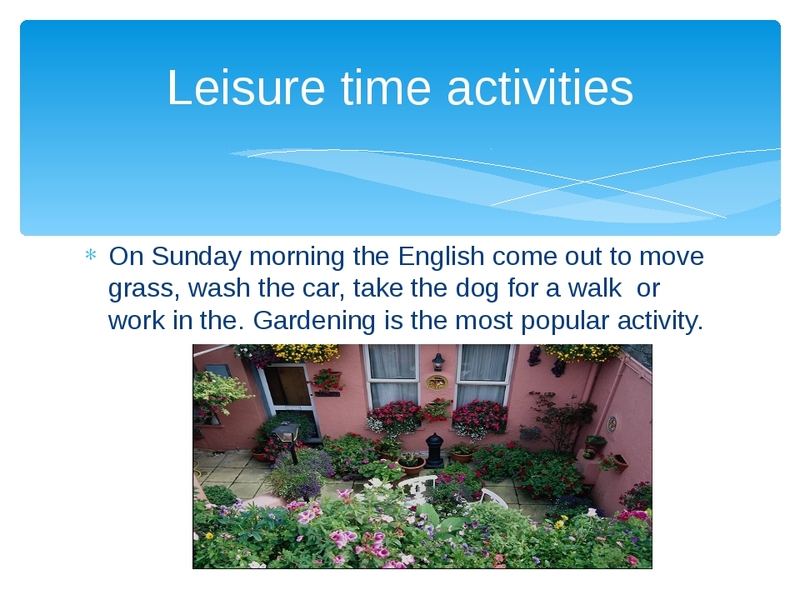 Their lawns are closely cropped, their flower beds are primly cultivated and their trees are neatly pruned. Everything is orderly. 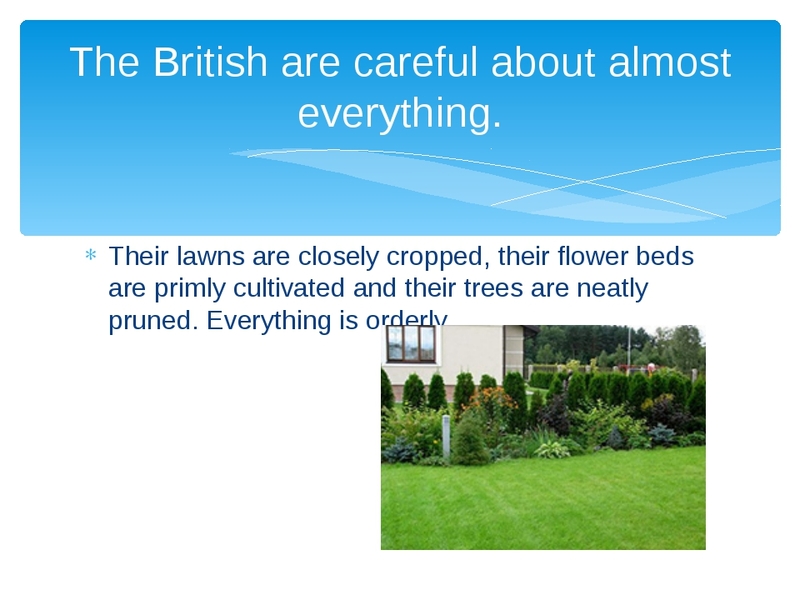 The British are careful about almost everything. 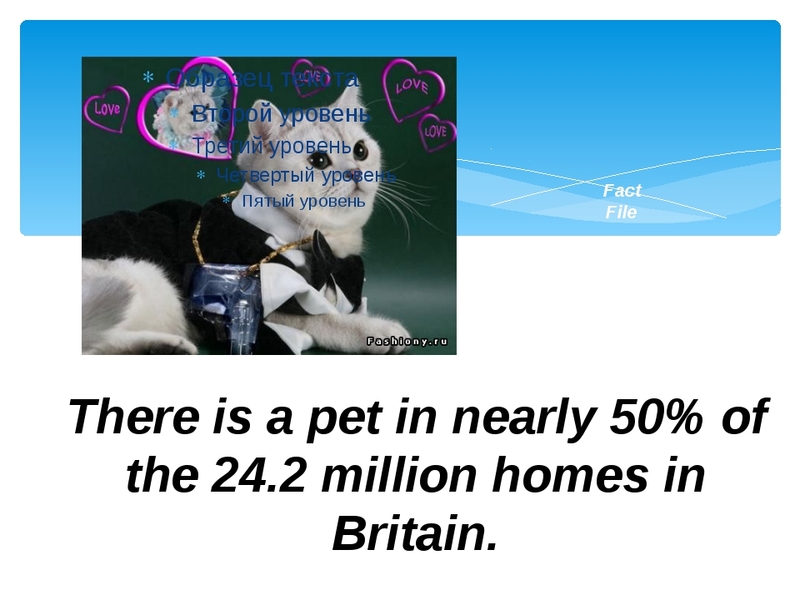 Fact File There is a pet in nearly 50% of the 24.2 million homes in Britain. 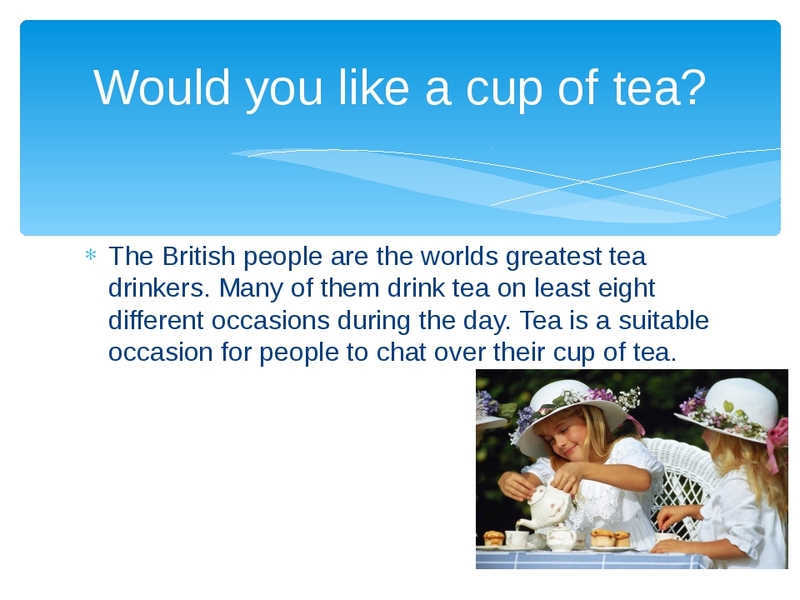 The British people are the worlds greatest tea drinkers. 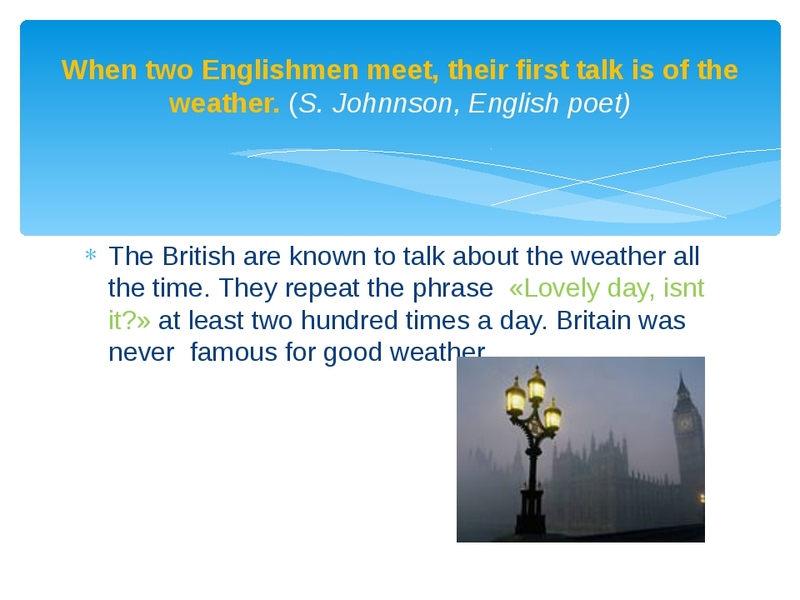 Many of them drink tea on least eight different occasions during the day. Tea is a suitable occasion for people to chat over their cup of tea. Would you like a cup of tea? 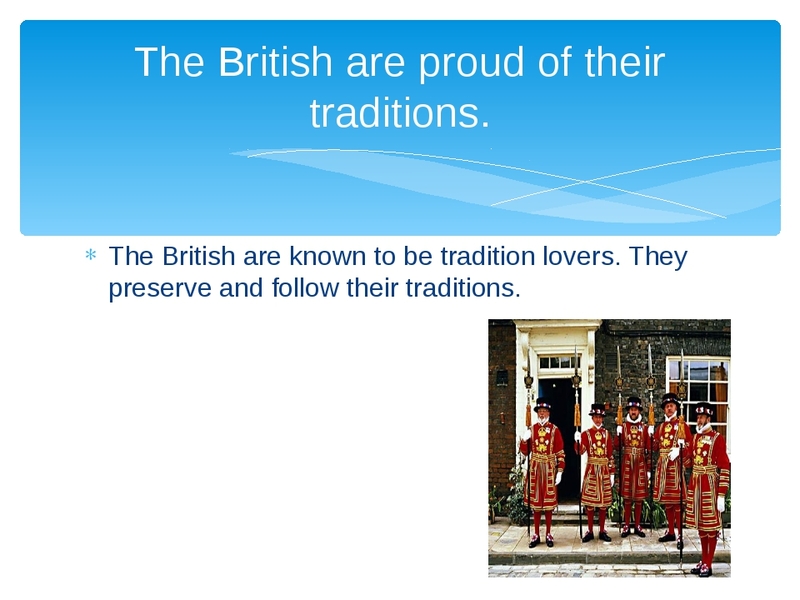 The British are known to be tradition lovers. 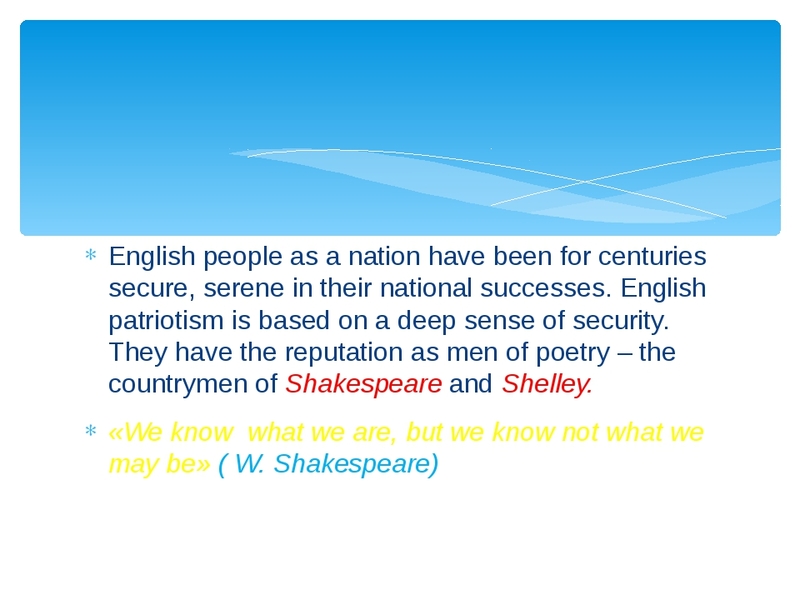 They preserve and follow their traditions. 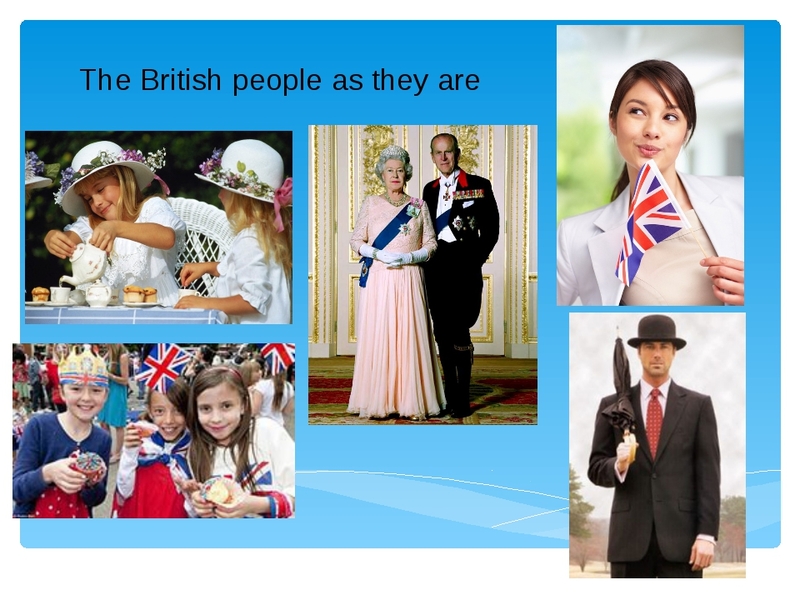 The British are proud of their traditions. 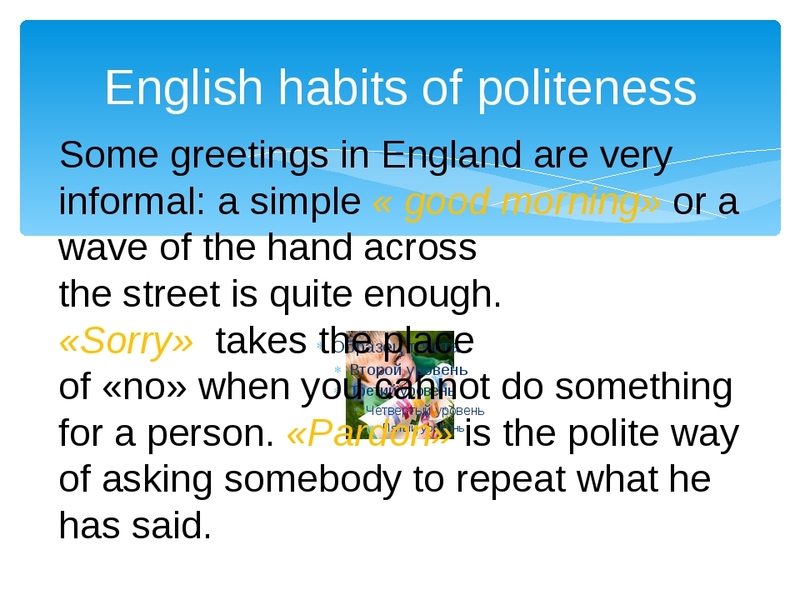 English habits of politeness Some greetings in England are very informal: a simple « good morning» or a wave of the hand across the street is quite enough. 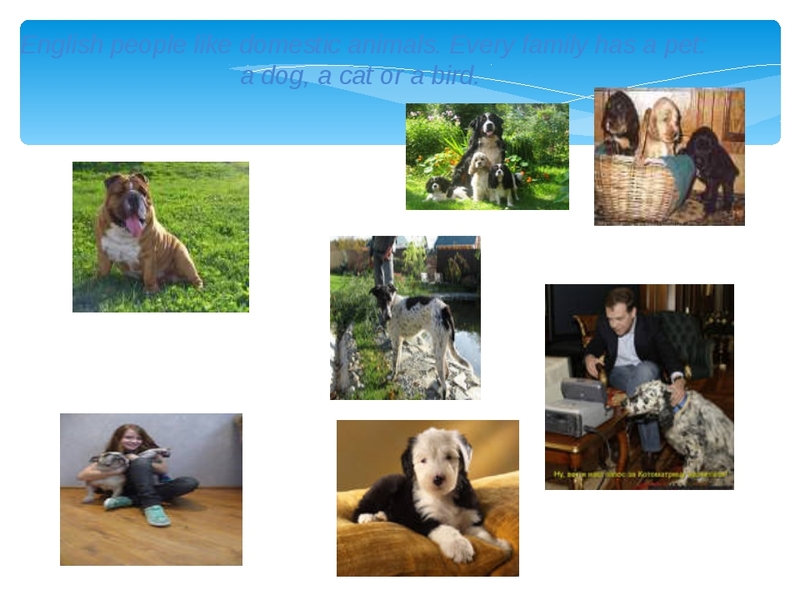 «Sorry» takes the place of «no» when you cannot do something for a person. 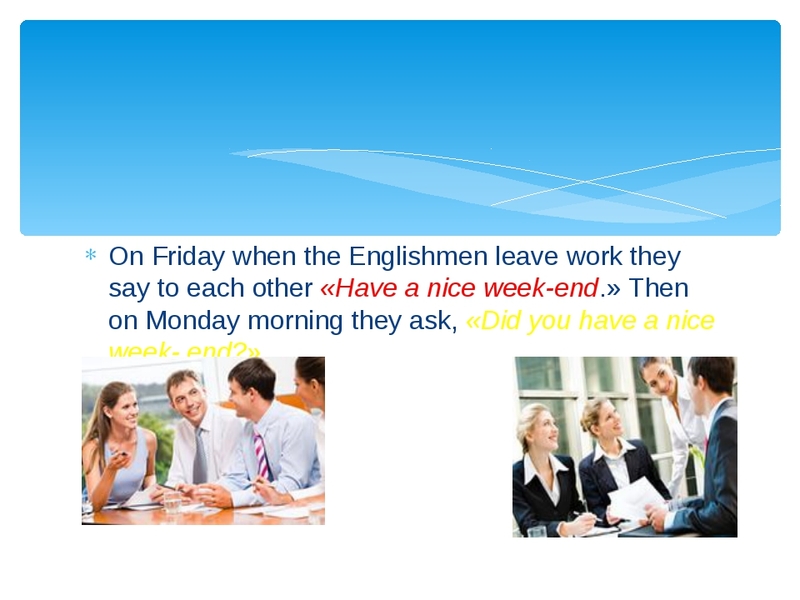 «Pardon» is the polite way of asking somebody to repeat what he has said. 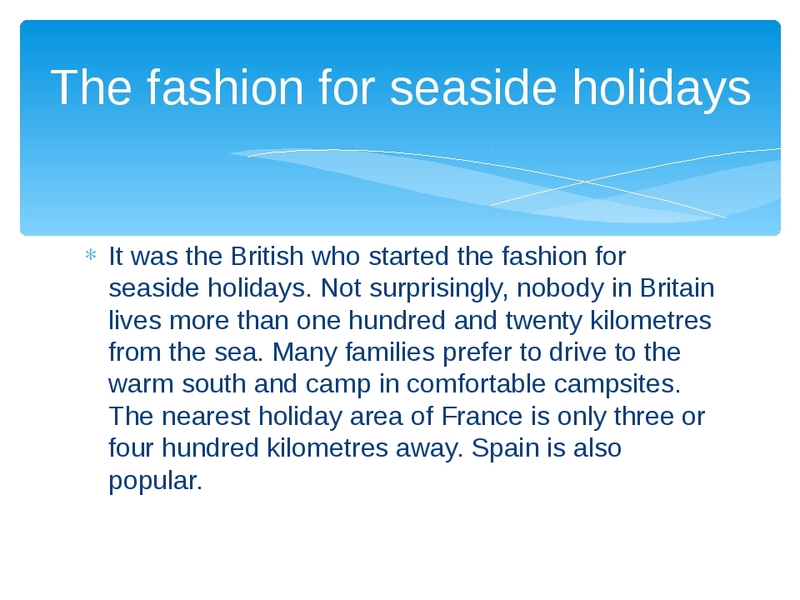 The nearest holiday area of France is only three or four hundred kilometres away. 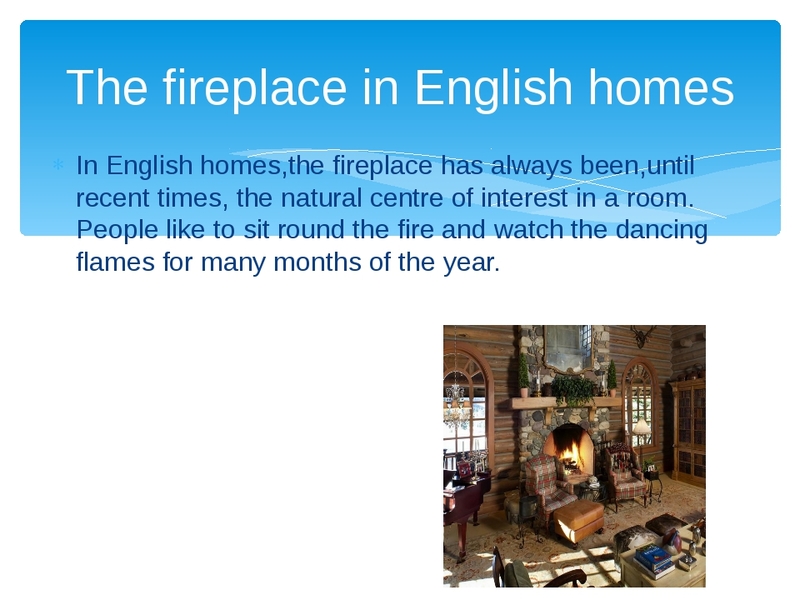 Spain is also popular. 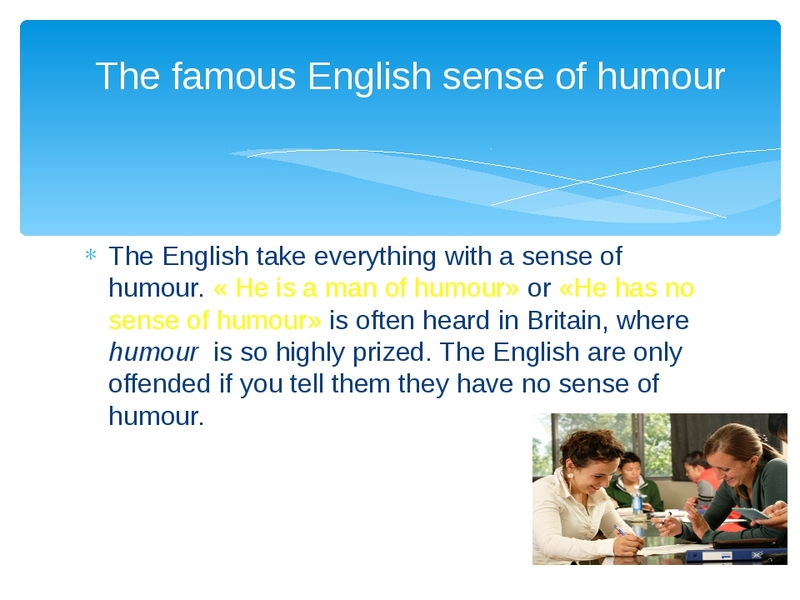 The English are a sporting nation The English like different kinds of sport. 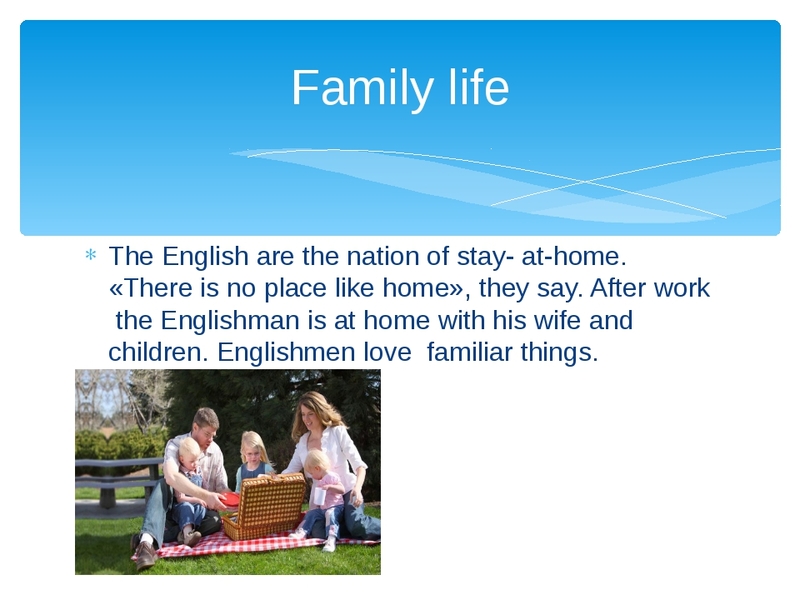 They often play football and cricket. 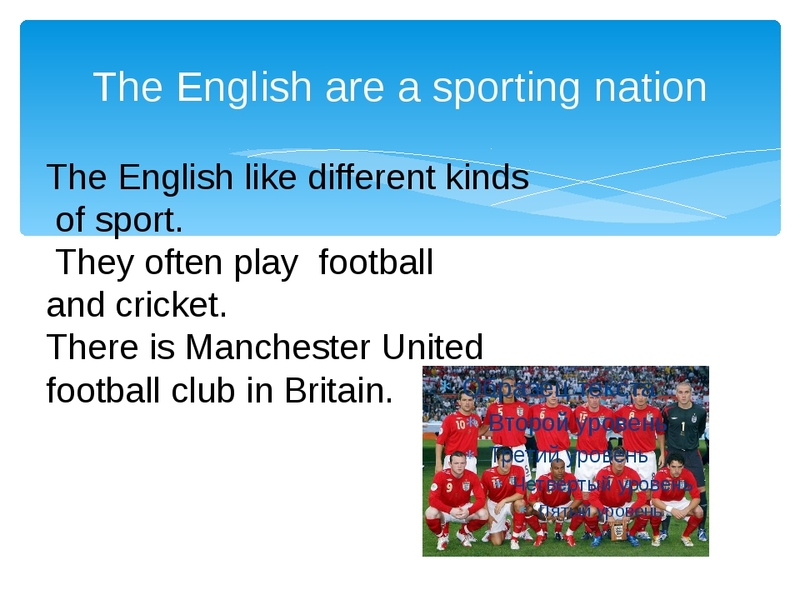 There is Manchester United football club in Britain. 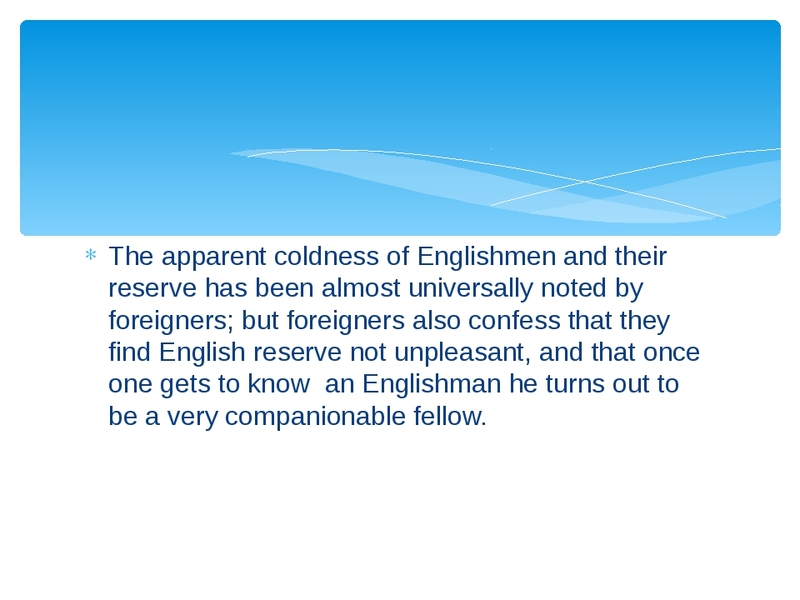 The apparent coldness of Englishmen and their reserve has been almost universally noted by foreigners; but foreigners also confess that they find English reserve not unpleasant, and that once one gets to know an Englishman he turns out to be a very companionable fellow. Данную презентацию можно использовать на уроках по страноведению для учащихся старших классов.Эта красочная презентация расширяет кругозор и обогощает знания учащихся.Данная презентация расширяет знания о наиболее специфических и интересных особенностях характера британских людей.Эта прекрасная презентация предназначается для работы под руководством учителя или для самостоятельной работы учащихся.Презентация подходит для работы по любому УМК по английскому языку.Особенно полезна эта презентация для работы во внеурочное время.В ней хорошо подобран материал по теме о жизни британских людей.